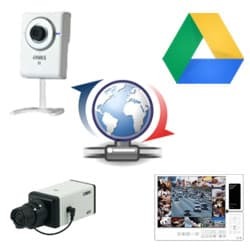 Some Zavio IP cameras now support the ability to backup recorded surveillance video footage to the cloud using Google Drive. Here is how it works. These Zavio cameras all have internal SD card slots and can be configured to record video to an SD card continuously, on a schedule, or triggered by an event. The cameras on that page are also all compatible with SAT Viewer. 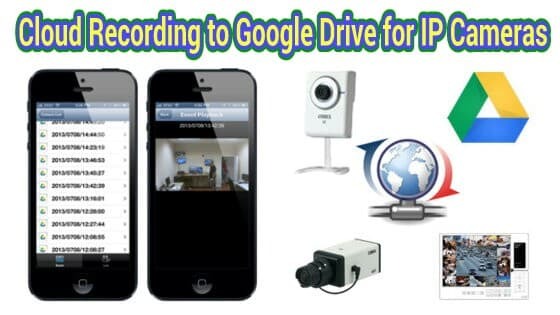 SAT Viewer is a simple cloud based IP camera application that enables users to view their cameras from any web browser. SAT Viewer is accessed through a web browser and works on both Mac and Windows computers. Another great feature of the SAT Viewer is that it is integrated to use Google Drive as a cloud storage drive that automatically backs up video that is captured on an IP camera’s SD card. Video footage that is stored in the cloud can be searched and played back from the SAT Viewer interface in a web browser or using the mobile app for iPhone, iPad, and Android. The below screenshot on the left shows the event list of recorded video files on the Google Drive account that is associated with this SAT Viewer account. The screenshot on the right shows the video playback that occurs when one of the videos is selected. In addition to enabling cloud storage, the SAT Viewer apps also support push video notifications. Please visit this page for more information on this cloud video backup solution for Zavio IP cameras.